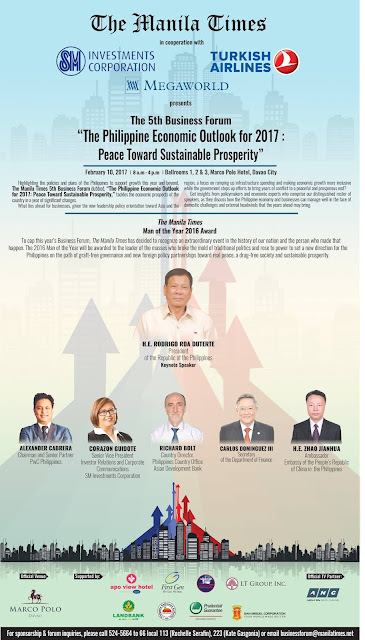 The Manila Times' 5th Business Forum, with the theme "The Philippine Economic Outlook in 2017: Peace Toward Sustainable Prosperity," is set to be held at the Marco Polo Hotel Davao this Friday, February 10 from 8:00am to 4:00pm. Aside from the previously-announced guests President Rodrigo Duterte (Keynote Speaker) and Finance Secretary Carlos Rodriguez III, His Excellency Ambassador Zhao Jianhua of the Embassy of the People's Republic of China in the Philippines, SM Investments Corporation Senior Vice President for Investor Relations and Corporate Communications Ms. Corazon Guidote, Asian Development Bank Philippines Country Office Country Director Mr. Richard Bolt and PwC Philippines Chairman and Senior Partner Mr. Alexander Cabrera are expected to be at the event. For more information on the Forum, contact (02) 633-0153 or 643-3887, SMS 0920-981-4376 or 0920-924-2532 or email info@exlinkevents.com.